Imported into the UK in 2009 and with an extensive restoration over the last 8 years, this is (finally!) 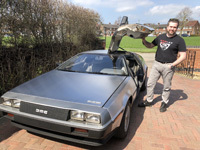 one of the best DeLoreans in the UK and is well known to both the Delorean Club UK and respected marque expert Chris Nicholson, both of whom will vouch for the car. Rare full B28E Euro spec engine - (dynoed at 160bhp). There are only a handful of DeLoreans worldwide in this spec - the one John DeLorean envisaged before having to face the US emissions requirements. In addition the car has featured in Classic Cars magazine (July 2015 - 7 page feature) - where it was described as "a superb example", and in ShortList magazine (Feb 2014). Both issues are supplied with the car, along with the full set of over 100 professional photos from the Classic Cars shoot. The car drives perfectly, starts on the button both hot and cold, and is available for any kind of inspection. It has recently performed two european road trips to the south of France - one in 30C temperatures, and the other sub zero, both without missing a beat, or needing any kind of oil top up. A number of spares are also included with the car, including ignition distributor, starter motor and various other items. Before I forget - mileage is 52k, although as with all DeLoreans it’s slightly academic. (In this particular case the whole car has been rebuilt over the last 5k miles, including a top end rebuild on the engine (new cams, rockers, head gaskets whilst in there) ). Worth noting that I currently do not have the air con compressor fitted to the car (I never put it back on after the engine work, as it’s heavy and I don’t use it), although it will be supplied upon purchase. The air con works when installed (I have the bills to prove it! 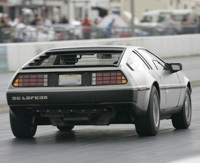 ), although as with all DeLoreans it's not particularly impressive when compared to modern cars! That’s a lovely D you have there. Best of luck with the sale, meanwhile, my search continues. Very sad to see it go jez ..
A very reasonable price Gez given the amount of money and work that has gone into it. This will be a good buy for someone for sure. cis6409 wrote: Very sad to see it go jez ..
Dont listen to the cyberbullies Gez!